No expense spared with this remodel. Everything very upscale and a view of the ocean. Turn key for your enjoyment or rental ready. Similar villas rent for $250.00/night! Highly updated throughout with new cabinets, closet system, granite, Samsung and Bosch appliances, walk in tiled shower and beautiful tile floors throughout. Exterior of building has new paint and railings happening nowGÇª and new roof installed in 2016. Fully furnished with high end furniture! With the huge ocean front pool and beach bar, tennis courts, workout room on the property, there is no need to leave. Incredible views and wonderful breezes, can you think of a better way to start your day? This villa is so light and bright and you can hear the waves rolling into the shore. Imagine the possibilities as you put your own spin on this direct ocean front villa. Bedroom wall has been opened up to give a larger master bedroom. Nice kitchen design has extra counter/island. 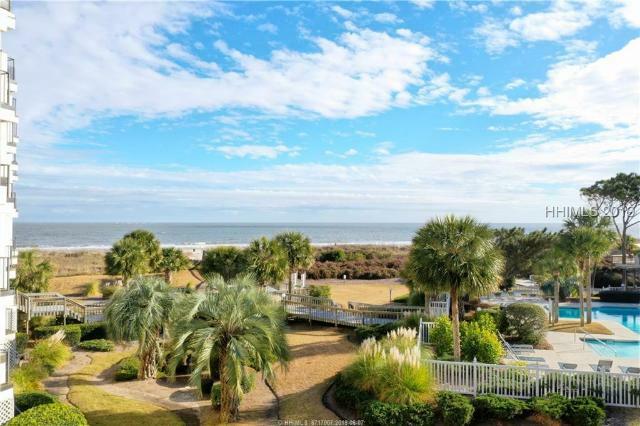 Enjoy all this resort has to offer with on site bike rentals, restaurants, ocean front pool, 10 lighted tennis courts, 24 hour security and mid island location! What a great deal! But hurry as these do not last. Completely remodeled villa & all top of the line furnishings & finishes you simply won't find a better villa on the market for this price. Beautiful tile floors throughout, pretty granite, new SS appliances, all new furnishings, designer touches, this villa redefines turn key! Your balcony overlooks the natural marsh area full of wildlife. It's peaceful and quiet yet just steps to all of the amenities this resort offers. The ocean front pool is exceptional, beach bar and restaurant, beach volleyball, on site bike rentals, 10 lighted tennis courts and more. This villa makes the perfect second home or vacation rental property. It's fabulous! Gorgeous first floor Fiddler's Cove with walk-in master bath tile shower, new luxury vinyl flooring throughout, smooth ceilings, crown moldings, newer couch, new washer and dryer and great sleeping quarters. Nicely decorated interior. Extra counter space. 24 hour manned gate. Steps to IslandGÇÖs best beach. Heated and cooled pool, 10 clay tennis courts, WiFi and TV included in monthly regime fee. Beach is short 5-6 houses away! Very nicely furnished! Great potential rental income. A Rare Find at a great price! Enjoy a peek of the ocean and gentle breezes from your balcony from this lovely updated 2 bedroom and 2 bath villa. Fully furnished and turn key/move in condition including new HVAC and stone flooring. Kitchen features granite counters and baths are all completely redone with new cabinets, granite counter tops, beautiful stone walk in shower in one and completely redone bath in the other. Stroll to the beach, oceanfront pool with food service and lighted tennis courts await you in this all inclusive Resort. A Great Value! Be sure to view the 3-D Virtual Tour. Don't wait - this one won't last.